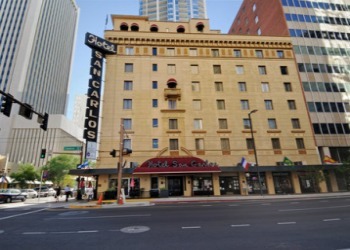 The Hotel San Carlos is Phoenix's only historic boutique hotel and has been in continuous operation since 1928. Each of our 128 guest hotel rooms has been individually decorated, and the history of Phoenix Arizona awaits you at every turn. 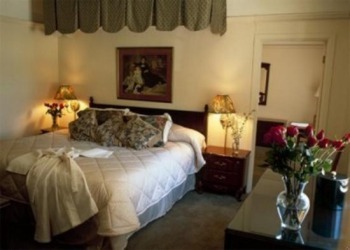 They invite you to stay with us and experience the courtesies of a gentler era. Hotel San Carlos is conveniently located in the heart of downtown Phoenix's financial, government, and entertainment district, just steps away from many fabulous local Phoenix Attractions. The ghost of Leone Jensen is said to roam the hallways of the San Carlos Hotel in downtown Phoenix, AZ. Witnesses claim to see her as a floating white, cloudy figure of mist. Unexplainable breezes accompany her presence. In almost every ghost book or story written about dear Leone tells of a scorned woman devastated by the rejection of a love interest. The stories say she was dressed in an elegant white evening gown ready for a night of dancing with her bellboy boyfriend from a nearby hotel. After her dreams for a romantic evening folded around her, she decided she could no longer live with a broken heart. She left her room on the seventh floor, climbed to the roof, and leaped off the seven story San Carlos Hotel. During this time the hotel continued to be a hub for the Phoenix elite, political and social, as well as a Mecca for Hollywood stars. Mae West stayed here in 1929 while performing at the Orpheum Theatre, 203 W. Adams, in "I'm no angel". It was reported she left orders with the front desk to "not be awaked until 3:00pm with a bottle of champagne and two glasses." The Phoenix Press Club was founded here. 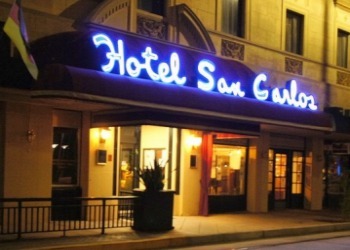 Clark Gable and Carole Lombard spent much of their romantic time here in Arizona at the San Carlos. Gable often referred to Lombard as the "love of his life." Marilyn Monroe was a guest during her filming of Bus Stop. She wanted a room close to our pool on the third floor, so that she could slip out to the deck and sunbath with the least amount of attention. Other stars such as Spencer Tracy, Jean Harlow, Cary Grant, Ingrid Bergman, Gary Cooper, Humphrey Bogart, Gene Autry, and big band artists Kay Starr, Woody Herman and Harry James all spent time here over the years. Governors, senators, and countless other notables, also enjoyed the services of the San Carlos over the years. From its inception, the French Caf�, the hotel's first restaurant, was immensely popular. The signature French Onion Soup was the "best in town." Adult libations were regularly embibed in the Palm Room off the lobby which served as the cocktail lounge. Anyone who was anyone routinely relaxed in the air conditioned comfort of the Palm Room. During World War II troops were housed in the hotel and our bar became known as "Base Operations" as more officers were present there than at Luke Air force Base headquarters.